Why have I called this a loaf? Simply put, I couldn’t decide if it was more cake-like or more like quickbread. 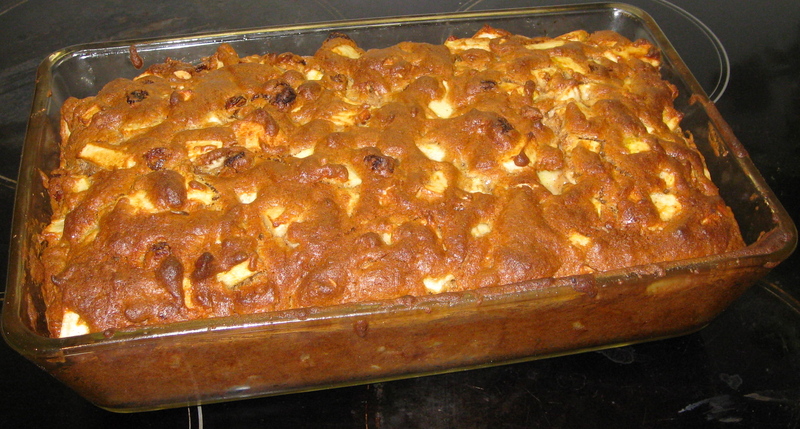 It certainly tastes rich enough to be called cake, but there are so many apples, raisins, and nuts that I’m inclined to call it bread to highlight its healthier side. I would totally serve this as a dessert, but it could just as easily be a healthy breakfast when schmeared with some peanut butter or cream cheese. Whatever you prefer to call it, this apple spice creation is incredible. It took longer to bake than I anticipated, because I forgot to take that into account when I decided to turn this muffin recipe into loaf form. But despite having to stick it back in the oven for another 25 minutes, the loaf miraculously didn’t burn and the top crust developed an amazing crunchy-chewiness. Would I make this again? Absolutely. It got rave reviews from F as well as C and A in Belgium, to whom we took part of the loaf last weekend. Preheat the oven to 325F (160C) and grease a loaf pan. Chop the apples and place them in a large bowl with the sugar and spices. Mix well. In another bowl, combine the eggs, oil, and vanilla. Mix into the apples. In the second bowl — or a third one — whisk together the flours, baking soda, and salt. Stir into the apple mixture. The batter will be thick. 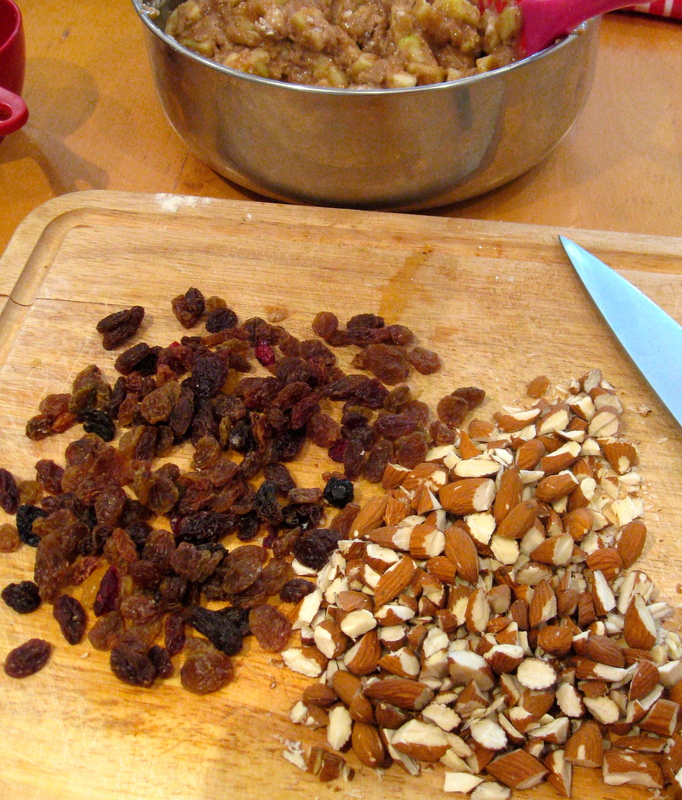 Fold in the almonds and raisins. Bake for 50-60 minutes, until a knife inserted comes out clean. This entry was posted in celebrations/holidays, food, health, pictures, recipes, travel and tagged breakfast, brunch on 08.04.2013 by taplatt.